They did it again. While we watched President Obama dodge the Syrian red line with Putin taking the lead, while we held our collective breaths as Israel’s Prime Minister Netanyahu and France’s President Hollande stalled negotiations over the Iran’s nuclear ambitions, the Islamists were at it again. This time they cunningly swooped in and placed their wildest dreams into the massive immigration reform bill recently passed by the United States Senate. Last edited by Newmexican; 11-27-2013 at 11:31 AM. Two key national security nominations by President Obama are up for confirmation following Congress‘ recess this week: former Republican Sen. Chuck Hagel to be secretary of defense, and John O. Brennan, the president’s key counterterrorism adviser, to be the director of the CIA. Both candidates have had to address issues based on their past and current activities and associations. Troublingly, a number of questions still remain unanswered. One explosive issue is a report by John Guandolo that broke last week on Tom Trento’s “TrentoVision Show” and also was carried by Glenn Beck on Feb. 11. The report stated that Mr. Brennan was converted to Islam while CIA station chief in Saudi Arabia from 1996 to ‘99. Let’s be clear: In America, a man’s religion can never be a condition to his holding a government position. It is protected by both the First Amendment and Article 6 of the Constitution. Therefore, even if it is true that he converted, Mr. Brennan’s religion should not be an issue. However, according to Mr. Guandolo — a former SWAT team leader at the FBI, counterterrorism and Muslim Brotherhoodspecialist and Marine platoon commander — what should be an issue was the Saudis’ targeted recruitment of Mr. Brennan to the ideology of Islam while he was serving as the CIA station chief in Riyadh. This was not just a conversion but a political act by a foreign intelligence service. The audacity of it: Illegal and breaking the law in the U.S. yet muslims continue to whine and complain, demanding ‘rights’! Are the authorities waking up to the statement in this article that muslims make up the SECOND LARGEST illegal immigration group in New York? South Asians basically means muslim with small exceptions (Southern Asia comprises the countries of Afghanistan, Bangladesh, Bhutan, India, Maldives, Nepal, Pakistan, and Sri Lanka). How many more illegal muslims are there across the rest of the country? If every 4-5 persons you come across in New York is illegal, like the article states, it’s a hell of a lot of law-breakers who should be deported, not rewarded. For every illegal given residency, you import at least 3-4 additional family members. So if the U.S. has 11 million known illegals, they would be importing over 30 million people. Fact is that the U.S. probably has 10x more illegals than anyone wants to admit. If half of New York’s population is illegal it would comprise of over 9 million people. Certainly the calculation of 11 million nationwide is a serious underestimate. The current official U.S. population stand at 316 million. 89 million are not in the labour force. The country has approximately 200 million people who don’t contribute any tax revenues. And that’s only he official numbers! Add the illegals on top of that. Unfortunately, laws force hospitals and schools to give free healthcare and education to illegals. That’s a lot of money to spend on people who contribute nothing to the nation’s revenues. Ataur was 18 when he left Bangladesh and arrived in the US in 1991 as an undocumented migrant. He took two jobs at the same time, earning about $35 a day. Vincent was smuggled into the US from China in 2001; his working conditions were even worse. He was employed in several Chinese restaurants, for 60-70 hours a week, six days a week, for about $300 a month, an average of $1 an hour. “In New York, if you go in the street … if you ask 10 people, I’m sure at least five or six are undocumented,” Vincent told IPS. Both asked that only their first names be used. The US is home to more than 11 million undocumented workers, and there are an estimated 2 million migrants working in New York. They are taxi drivers, domestic workers, restaurant, retail and construction staff. They are paid far less than the city’s minimum wage of $7.25 an hour, and they are often mistreated by their employers. Their lives may undergo major changes if the US House of Representatives approves an immigration bill, passed by the Senate last month, which offers a 13-year path to citizenship for undocumented migrants, but also reinforces border security and enables businesses to check workers’ social security numbers, under the E-verify programme. The programme would make “every single undocumented person one click away from being notified or deported”, according to Monami Maulik, executive director of Desis Rising Up and Moving (Drum), an organisation of low-wage south Asian immigrants in Jackson Heights, Queens, which has 2,000 members. After Latinos, she added, south Asians are among the second-largest undocumented population in New York. According to Vincent, employers tend to say: I hire you even if you’re illegal, so you should say ‘thank you’, no matter how much I pay you. Because there are so many undocumented migrants ready to work for extremely low wages, other needy workers are pressured to accept the same conditions, no matter what their immigration status and nationality are. Ataur’s sister, Amana, arrived legally in the US, but was paid less than the minimum wage for eight years. Mental pressure at the workplace is huge. “When you’re late, they fire you. When you’re sick, they fire you … When you complain [about] anything, they can fire you,” said Vincent. Maulik said employers often do not pay workers for a week or months at a time. “There has been a case of a year at a time. They’ll do things like hold people’s passports, threaten to call immigration if they ask for the wages that they earned,” she added. In 2009, Drum launched monthly rights clinics to help migrant workers reclaim unpaid wages and raise awareness of their rights. 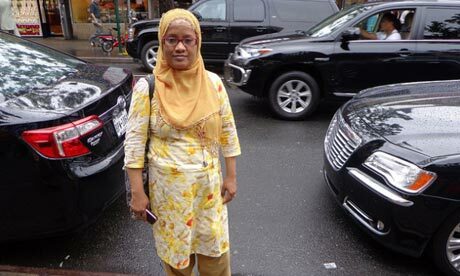 In a phone interview, Sayma Khun, a Bangladeshi national, described how she managed to recover, with the help of Drum, $5,000 of unpaid wages. In 2008, Vincent, with 35 colleagues, filed a lawsuit against their employer, in this case with the help of the Chinatown-based Chinese Staff and Workers’ Association (CSWA). But as soon as the lawsuit was filed, the restaurant was shut down. It reopened later in a different location under a new name, a strategy widely used by some employers to avoid lawsuits, according to Vincent. In order to launch a neighbourhood-wide investigation into workers’ rights, the department of labour needs a certain number of individual complaints. But workers often refrain from complaining because they fear employers’ retaliation and deportation. The husband of Nadera Kashem, a Bangladeshi Drum member, is at risk of being deported after he was caught during a police raid last year at the perfume shop he worked in. Because he was undocumented, he was sent to an immigration detention centre. He has been there for 17 months. “The employer is supposed to be punished [in such cases], but it always means the worker is punished,” said Maulik. At the local level, immigration is being enforced by police officers, often accused by migrants’ rights organisations of profiling and discrimination. “The biggest fear an undocumented person has is the local police officer, because that’s the person who’s going to stop you, ask you for identification, possibly deport you,” Maulik said. “We see no future, why are we still working like slaves? So that’s why I organised my co-workers, we wanted to improve the working conditions, and not just for ourselves,” Vincent told IPS. Before joining CSWA, he said, he did not even know that there was a minimum wage or what overtime meant. “Organising protects you, never puts you in trouble,” is what Kazi Fouzia, a Bangladeshi community organiser who joined Drum in 2010, tells other migrant workers to encourage them to speak up. Fouzia used to work in a sari shop in Jackson Heights. Her employer, who owned three stores, asked her to collect clothes from another shop across the street. While she was crossing, she was hit by a car and thrown 13ft. Fouzia’s employer did not allow her to call the emergency services because she was undocumented. She had multiple fractures in her shoulder, but she did not have insurance so the only medical care she received was painkillers. The next day she discovered she had been fired. This is not only a personal story, she told IPS, “this is every undocumented worker’s story, every one”.